Who's the nutter with the stop sign? Today I found myself doing something I would never have imagined 2 years ago. After having a grown-up meeting with a colleague to talk about my return to work next year, I stopped to stare at a digger. Not content with just witnessing its mechanical genius myself I pulled out my iPhone and started videoing it in action. This surreptitious manoeuvre not surprisingly caught the eye of the workman who started yelling at me – at first I thought they were flirting, (the wishful thought of a deluded mind), so I yelled back “It’s for my son” and when he answered “he’ll get more of a kick out of it if he sees you in it” I realised the guy was asking whether I wanted to be in the shot. Relieved at my mistake, no really, I handed over my iPhone like an excited teenage girl and started giggling in front of a moving digger. You see garbage trucks, diggers, dump trucks, tankers, fire engines, excavators, road graders, street sweepers, cranes, cement mixers, grocery trucks, ambulances, big rigs, b-doubles and police cars are now the coolest things in the world. I have been brainwashed by my two year old and I can’t let one pass now without saying “Whoa look!” which can be embarrassing if you are not in the company of two boys under 2.5. This obsession saw me; run with a double pram about a kilometre to see a fire engine parked in the distance (we got there! 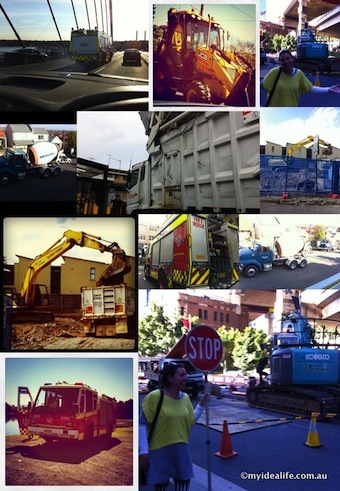 ), get stroppy when we couldn’t stop to photograph an excavator because we were going to block traffic and get illogically excited about travelling (very slowly) on arguably the busiest, most truck-ridden road in Sydney. And now we can add stopping road works to my repertoire just so as to rush home and share the big digger I saw with my fascinated little boy who undoubtedly will say, “Woooow, look at that!”. My day is complete, not to mention my life. "Look! Garbage truck! Quick Mummy chase it!"? ©MyIdeaLife, 2011, All rights reserved.